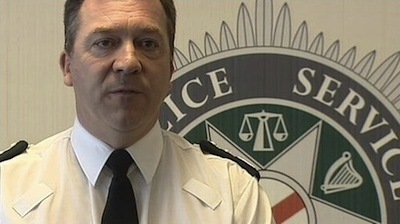 The 55-year-old English police veteran did not reveal a motivation for his sudden announcement, but insisted it had been a “real privilege to lead the PSNI through the immense changes of the past few years”. He added that in the remaining months he would try to “ensure the PSNI has the resources to deal effectively with the many challenges ahead”. Baggott had become increasingly mired in controversy despite his upbeat promises of a new community policing on his arrival to Ireland. Although an inevitably difficult issue, he handled the issue of parades disastrously, and intense rioting becoming an annual event, particularly in north Belfast. Every year his force faced increasing condemnation by nationalists and republicans for failing to stand up to orchestrated loyalist violence or to simply implement the law on parades. His softly-softly approach to loyalist parade paramilitarism served only to encourage UVF violence. Last winter, flag-waving loyalists rampaged across Belfast on a massive scale, bringing the city to a virtual halt for weeks on end and with little or no response from the PSNI. In addition, his failure to end the persistent Crown force harassment of nationalists, with violent house raids, oppressive stop-and-search detentions, recruitment of informers, and the effective internment of republican activists, ensuring that anger and distrust of the police by nationalists has only worsened over his tenure. He once vowed to turn the PSNI from a ‘post-conflict’ colonial police force into a community police service -- but in the end he was forced to bring in reinforcement British riot police and recall British troops onto the streets of the north of Ireland. The Six-County Policing Board will meet in two weeks to discuss the matter of his replacement, and PSNI assistant chief George Hamilton and Scottish police boss Stephen House have been named as possible candidates. While his actions have long drawn the wrath of both nationalists and unionists, there was some praise from unionists. The DUP group leader on the the Six-County Policing Board, Jonathan Craig, said that “whilst we did not always agree with some of the decisions he made, I and my colleagues always found him willing to listen and take our views on board”. If he stays until his contract ends in September, Mr Baggott will face one last marching season. Sinn Fein member of the Policing Board Pat Sheehan said: “There were many areas that Sinn Fein disagreed with Matt Baggott among them his treatment of the Ombudsman’s report into the McGurks Bar and his initial failure to deal with the flag protestors.